Robert Scoble, one of the most generous and bountiful writers of valuable social media content over the past many years, took issue with someone who cited something on Twitter that he wrote on Facebook, without linking to his Facebook post. Because it’s out of context, Scoble wrote it doesn’t serve readers very well, “because they don’t have a link to the original content…It is a breach of the implicit contract between us, which is to keep conversations self contained.” I’d take that one step farther, saying it’s a form of plagiarism. Those of us who diligently create original content in articles, newsletters, blogs, Facebook, Twitter, etc, and now Google+ all have suffered with scrapers who steal our content, bloggers who change a few words of our posts, or sometimes only change the headline, and run our posts without a link to our website or blog. There’s even a new type of content theft/spam I’ve noticed, where trolls add 50 comments to your blog post, each one quoting a line from your post as if they wrote it. Why? They want the link back to their site when the comment appears on your blog with a link to the “author’s” site. That’s because Google rewards sites with lots of links from other sites. I’ve basically given up trying to run down the trolls who steal content, thinking of them simply as pathetic. But Scoble’s right, there is an implicit contract in social media. It calls for honesty, respect, and links to original content. There’ll always be people who take advantage of people who have the chops to write their own content. And maybe someone as smart as Robert Scoble will figure out a way to deal with them. Meanwhile, I’ll look at content thieves as pathetic creeps and keep on writing and sharing new material. Eventually Google catches up with such black hat techniques as this, and penalizes the site that is linked to. You might call this comment backlink spam. I guess I would just delete all such comments as soon as I saw them. One of the more silly troll techniques is when they quote you, then accuse you, not of what you said, but some tangent they make up, as an implication. This is like slander or pseudo plagiarism, quoting you then adding to what you said, as though you were thinking it. It can make you look at lot worse, and it almost demands a reply, although often it’s best to just cut off all interactions with such trolls, because it can go on and on and on. 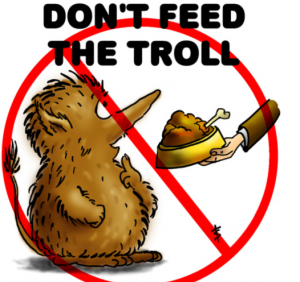 Thanks for linking to my post on G+ trolls.